Thoughts and Musings not initiated through normal conduction pathways. 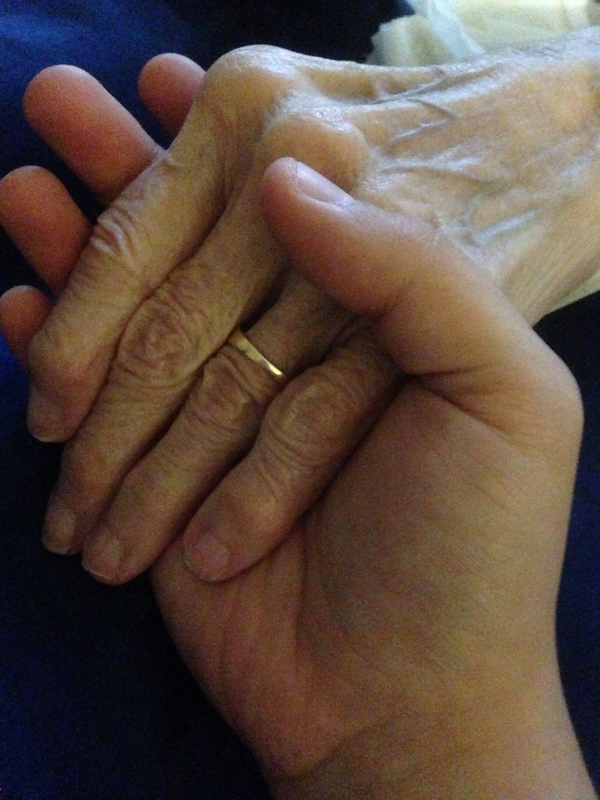 My Gramma’s hand, held by my sister’s, a few days before Gramma passed away. We were dispatched for trouble breathing. It had been a busy night, back-to-back calls, all kinds of patients. The day had felt rather hurried and frantic. My partner and I were both a few PCRs behind. We arrived on scene at a single family home and a woman waiting out front for us. “It’s my mom…. something’s not right…” she trails off, obviously upset, fearing that we’re going to bear horrible news when we see her mother. The house is old, with narrow hallways and tight corners. We leave the cot in the hallway leading to the back bedroom because it won’t make the tight turn. I carry my monitor and airway bag. This post authored by Ventricular Escape Beats contributor siren911. Welcome to the new home of my EMS-related thoughts and rantings! For those of you who followed me on The Nightshift Squirrel, thank you so much for making the jump to this site. I’m not entirely sure what happened to the guys I was working with on that site – they’re still active on facebook, but have completely stopped updating the site and have stopped responding to my emails and messages. So, rather than just continue to manage their facebook page for them, I’ve decided to step out on my own. I plan to recruit a couple other EMS and public safety type folks to contribute here, as well. For those of you who are just joining us out in TV land, WELCOME!! Thanks for joining me. This should be an exciting adventure. I plan to post as often as I can, but in all reality, the life of a paramedic is an unpredictable one, and some months I might post several times and other months you might not hear from me. If YOU would like to contribute, please email me at dave@ventricularescape.com and I’ll happily add you as a contributor to the blog or the facebook page, whichever you’re interested in. Take a look around – I’ve reposted my favorite blog posts here, and I plan on migrating over some of my other, older entries, too. Stay tuned!